Kung Hei Fat Choy! Happy New Year! From Beijing to Bangkok, Asia is ringing in the Lunar New Year on February 5th this year. This year is the Year of the Pig -- the last of the 12 animals in the zodiac. According to Chinese mythology, the Jade Emperor called for a race between animals. Twelve animals showed up and as each crossed the finish line, they were assigned a year of the zodiac. While the pig came last and may be thought of as slow and lazy, people born in this zodiac are considered to be disciplined, hardworking, gentle and optimistic. The Lunar New Year is also when one of the largest annual human migration takes place, as millions of people return home to celebrate with their families. For Chinese people all over the world the Lunar New Year is the most important celebration of the year -- a time to think about the past, honor ancestors and prepare for a successful year to come. It begins on the first new moon of the first month of the lunar calendar and ends two weeks later with the full moon. The exact date of the Chinese New Year changes each year according to the lunar calendar but falls sometime in January or February. Before any celebration can begin, houses are cleaned, debts are paid, and new, brightly colored clothing is purchased. The festival includes folk dances with people dressed up in gigantic lion and dragon costumes, fireworks, temple visits, and elaborate meals. The two-week celebration concludes with the Lantern Festival, when people crowd the streets carrying a variety of lanterns or set them afloat on the river. A year is either to be feared or celebrated. To ensure good luck in the coming year, people place symbols of good luck around the home, such as certain blossoming flowers, mandarin oranges, and pictures of powerful guardians. Red door banners, dragon dances, and the loud beating of drums protect home and community by fending off evil spirits. To ward off evil and keep good luck inside the home, some Chinese hang pictures of door gods or lucky words on either side of the entrance to the home at New Year. Prints of door gods come in pairs and are posted on the main entrance of the home. The figures face each other in order to better observe everything that passes through the door! The two most frequently seen door gods represent the generals Qin Qiong and Yuchi Gong, who are celebrated for having saved an emperor from the threat of demons. Each can be identified by his weapon: Yuchi Gong holds a steel whip and Qin Qiong grasps a sword. 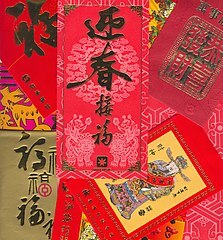 Other traditions include exchanging little red envelopes with money as a symbol of good fortune and feasting on noodles, dumplings, sweet rice balls, and fish.